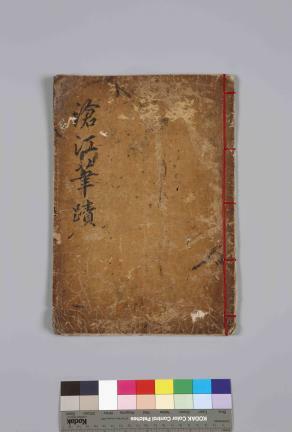 『조속 필적 창강필적(趙涑 草書 蒼江筆蹟)』은 조속(1595~1668)이 벽성군수로 재임하던 1646년(인조 24) 7월에 당시(唐詩) 오언ㆍ칠언율시 등을 대중소로 크기를 달리하여 쓴 것이다. 일반 서책처럼 선장(線裝)되어 있으며, 보존상태도 양호하다. 말미에 “병술초추, 창옹재벽성견한(丙戌初秋, 滄翁在碧城遣閑)”이라 하여 52세 되던 1646년(인조24) 7월에 벽성에서 한가한 틈을 보내고자 썼음을 알 수 있다. 조속의 필적이 꽤 남아 있는데 대부분 단편이거나 여러 사람의 필적과 함께 묶여 전한다. 이에 비하여 《창강필적》은 조속의 단독 서책으로 그의 전형적인 서풍을 잘 보여주는데, 특히 당시로는 드물게 원나라 선우추(鮮于樞)의 서풍과 유사성을 보여 주목된다. 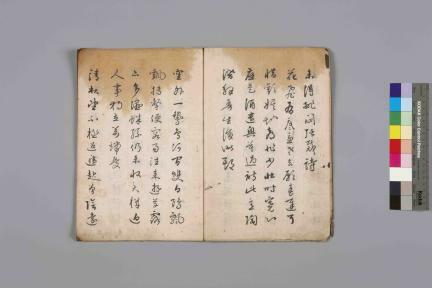 This album contains five-word and seven-word regulated poems from the Tang Dynasty, written in the hand of Jo Sok (1595-1668), in the seventh lunar month in 1646 (the 24th year of King Injo’s reign) when he was the chief of Byeokseong-gun County. These poems are written in varying sizes of characters, and the calligraphies are bound like a book. The album is in a very decent state of preservation. The phrase at the end of the album states that these calligraphies were made in the seventh lunar month in 1646, when he was fifty-two years of age, in his free time, while in Byeokseong. Quite a few writing samples of Jo Sok have survived to today, but most of them are small samples or are included in albums containing calligraphies of many other people. This album, a larger sample of his writing, is dedicated exclusively to his calligraphies, and works included in it also bear a more faithful testimony to his style. Interestingly, his calligraphy style in this album is evocative of that of Xian Yushu.